Akin to a remote group of peaks in the heart of the Buckindy Range of the North Cascades, the naming here follows an obvious Lord of the Rings theme. However, unlike my earlier exploits in which I only ever visited outliers of the range such as Mount Chaval, Snowking Mountain and Green Mountain, my feet (and hands) have touched the tippy tops of these two rock heaps. Well, almost. I chickened-out at the au cheval/arete section of Gandalf's exposed summit boulder a mere handful of feet below the summit proper. I suspect most that come this way are similarly repelled, no Orc's required. Fortunately, attaining the top of slightly higher Mount Aragorn is much less intimidating, albeit more difficult given that it's a boulder problem. Anyway, the peaks here are predominantly composed of weathered granitic rock and have a distinctly "east-of-the-crest" feel. In fact, it reminds me a lot of the Pasayten Wilderness in the Northeastern Cascades of Washington. Except in place of long abandoned mining cabins, the VOC's lovely Brian Waddington Hut located on the west shore of Long Lake makes for a perfect base from which to explore the area. Nearby Mount Shadowfax also appears to be a popular objective, making for a neat trifecta easily doable in a day from the hut. Note that some maps have Gandalf and Shadowfax inadvertently switched. And beware the blood suckers along Phelix Creek Branch FSR, should you attempt to outrun them most of the way up to the trailhead as I did! Finally, a refreshing dip in nearby Birkenhead Lake and/or Anderson Lake is highly recommended following a sweaty, buggy couple days of rambling in the so-called Tolkien Group. Weart. An attractive mountain with an unpretentious name. Climbable as a somewhat long day trip, or as a casual overnighter with a camp at beautiful Wedgemount Lake, Weart is one of the classic peaks in the Whistler area. It is directly opposite majestic Wedge Mountain, which at 9488 feet is the highest in Garibaldi Provincial Park. It offers an excellent perspective on the stunning Wedgemount Glacier flanking Wedge's North Face, not to mention its much larger cousin, Weart Glacier. The Southeast Ridge I followed makes for an aesthetic and easy scramble, save for a bit of tedious boulder hopping up from the current Wedgemount Glacier terminus. The glacier has retreated dramatically in recent times and its snout now floats in a smaller lake/pond well back from its previous terminus in Wedgemount Lake. An exposed ridge traverse from the summit over to Mount Cook, named the Armchair Traverse after the small glacier cradled in the cirque beneath the two peaks also appears to be a reasonably popular objective. A dusting of fresh snow on the upper mountain and horribly loose rock (initially at least), convinced me not to follow the fast-moving traverse-bound twosome just ahead of me. 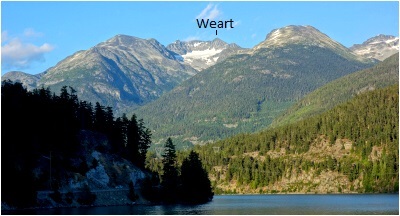 Either way, an awesome panorama of glaciated peaks to the south that include the Spearhead Range, McBride Range and even a glimpse of the very northern tip of Harrison Lake help to make Weart a memorable experience. Unbelievably, 11 years have elapsed since my previous trip to the Chehalis Range. This time I was indifferent to going whole hog on the Viennese-Recourse-Clarke Traverse, as classic a route as it is reputed to be. Mount Clarke, the highest in the area (Grainger Peak to the north excepted) and typically the last of the three summits climbed on the traverse would be reward enough. Besides, the description in the Scrambles Guide speaks very favorably of Clarke's standard Southeast Ridge route, an endorsement worth acknowledging IMO. So, with all that said one might ask why this trip report is for Recourse Peak then? Recourse is the middle of the three summits and the second highest. Unlike Clarke and to a lesser extent Viennese, the route to Viennese-Recourse Col and start of the ESE Ridge is by far the most direct of the three. Factor in especially warm weather, a brutally steep and somewhat brushy grunt up from Lower Statlu Lake the previous day and an ugly vertical bushwhack in order to gain the upper basin and suffice it to say that certain member of this party simply had had her fill. For the third consecutive outing I was to complete the climb solo, oh and "please hurry" because there's no shade (in the upper basin). Recourse, as it turns out is a worthwhile climb unto itself and presents its own challenges and excitement, albeit short-lived ones. It's position and perspective on the knife-edge WSW Ridge of Viennese is incredible. I'd be lying if I said I didn't briefly consider running the ridge over to Clarke from Recourse's summit and back, a kind-of half-traverse, but then there would surely be hell to pay for such indulgence! All-in-all a beautiful place and well worth a visit, but I might be another decade before I attempt a Chehalis Range hat trick! An outlier to a collection of crowded peaks ENE of Pemberton which include Cirque Peak and Cayoosh Mountain, Mount Marriott is a sprawling massif that also bears the distinction of being the highest in the Western Cayoosh Range. Just shy of the 9000-ft mark, Marriott is characterized by a long SE Ridge that offers a most pleasant ramble on granitic rock. The recently renovated Wendy Thompson Hut, situated in the lake basin southeast of the peak makes for an ideal base from which to bag the peak, not to mention escape the swarming mosquitos. We timed this one just right, taking full advantage of a still mostly snowbound basin well above the hut, sparing us from what would otherwise have been a lot of tedious boulder hopping. Some steep snow and hardpan had to be negotiated in order to gain ridge crest, after which a delightful stretch of sidewalk-in-the-sky ends with a descent to a large sandy saddle. I continued up from the saddle by passing a prominent gendarme to its left before regaining the blocky ridge crest for the remaining climb to the summit. If from any point along the ridge you find yourself thinking that the summit seems rather far away, rest assured that your eyes are not deceiving you. The SE Ridge does seem to go on forever! 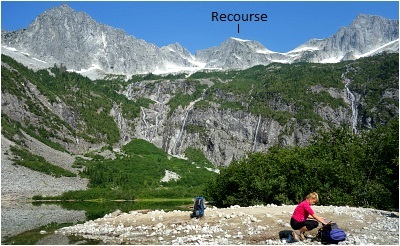 Cayoosh Mountain is a prominent peak directly opposite the highway from the ever-popular Joffre Lakes Provincial Park. It stands relatively isolated and boasts a fantastic 360-degree summit panorama overlooking the southern portion of the Duffey Lake Valley and surrounding area. While it apparently makes for a popular ski touring objective in Winter, its Summertime popularity pales in comparison to the park just to the south. The standard South Route I followed entailed a fair amount of route finding and travel over hardened scree, dirt, and rotten snow to eventually reach a pair of slanting snow fingers, and arguably the crux of the route. After some shenanigans following the upper finger and rock rib to its right, I finally reached the mostly horizontal South Ridge...think sidewalk-in-the-sky. A small saddle separates the ridge from the blocky slabs that make up the final summit block. Once up on top, I briefly exulted in the view and choked down an energy bar before returning the way I came to relieve Dan from his nap in the basin below. I'd give this one a 3.5 - 4 out of 5 stars, with the deduction for the tedious boulder hopping and overgrown forest road on the approach and return.